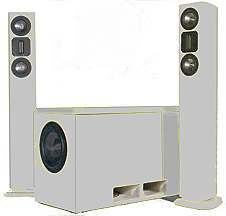 The VOX 253 MTI, a 3 way floorstanding speaker, is an original Visaton kit. This kit is a collaboration between CNC cabinet designers, Visaton and the magazine Hobby HiFi. The original VOX 253 became quite a bit slimmer since a separate cabinet was designed for the subwoofer. This subwoofer cabinet was equipped with two bass drivers, placed symmetrically opposite one another, practically an impulse compensated system (see also Hexagon by Bernd Timmermanns). The titanium midrange / bass driver and the MHT magnetostat are located - as in the original VOX 253 MIT - in the upper part of the much slimmer cabinet. the two bass coils have to be exchanged for two 4.7 coils. As requested by many of our customers we also offer a version with high-end crossover, that was already highly appreciated by customers who had bought the VOX 253 MIT. This version contains the coil adapted for the subwoofer. the 2.2 Ohm would get extremely hot already at 10 Watt per driver. Please note: a 4.7 Ohm instead of 3.3 Ohm should be used, since the coil has less resistance.